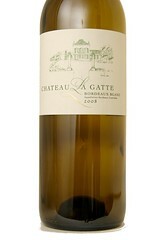 60% Sauvignon Gris, 40% Sauvignon Blanc There is but one hectare (2.2 acres) of blancs planted at La Gatte, dating 1985. The rarely-seen sauvignon gris is pink in hue, has thick skins and gives great girth and body ; the sauvignon blanc lends much-needed aromatics. Dry, with nice acacia flower adn delicate mineral nuances, this wine makes a wonderful aperitif drink or can hold up to all seafood dishes, white meats, sauces, smoked meats and saucisson.